Intel on Monday announced its computing tech is being loaded into Waymo self-driving minivans as the chip giant seeks a leading position on the road to autonomous vehicles. 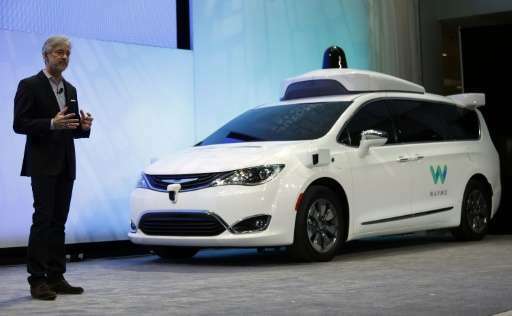 Intel computing technology enabling "real-time decisions for full autonomy in city conditions" has been built into the latest self-driving Chrysler Pacifica minivans being tested by Waymo, a unit of Google-parent Alphabet, according to Intel chief executive Brian Krzanich. "Given the pace at which autonomous driving is coming to life, I fully expect my children's children will never have to drive a car," the 57-year-old Krzanich said in a blog post. "That's an astounding thought: Something almost 90 percent of Americans do every day will end within a generation." High-performance hardware and software is required to enable self-driving vehicles to interpret what is happening around them and respond in real time. Intel announced plans for its own fleet of self-driving cars last month following its completion of the purchase of Israeli autonomous technology firm Mobileye. A day after closing the $15 billion deal to buy Mobileye, which specializes in driver-assistance systems, Intel said it will begin rolling out fully autonomous vehicles later this year for testing in Europe, Israel, and the United States. "Building cars and testing them in real-world conditions provides immediate feedback and will accelerate delivery of technologies and solutions for highly and fully autonomous vehicles," said Mobileye co-founder Amnon Shashua, who is to run the unit for Intel.